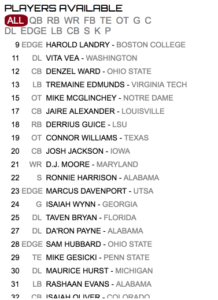 Now that the NFL Free Agency period has somewhat died down, I figured now is as good a time as any to post a full mock draft addressing the needs that the Redskins still have. There are some pending moves that Redskins Nation is waiting on pins and needles to hear happen- *cough* Hankins! *cough*. Excuse me, I got something caught in my throat. 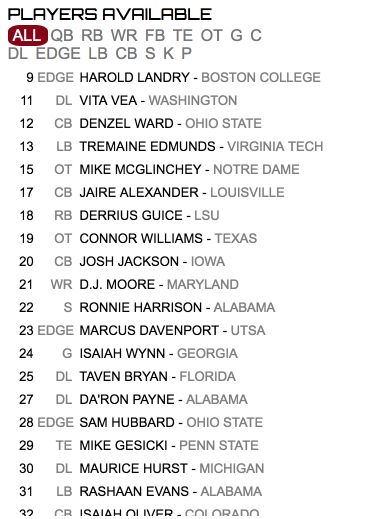 To make this mock draft, I went into it under the assumption that the Redskins don’t end up signing Jonathan Hankins, Pernell McPhee, or Junior Galette. I also need to preface this mock by how I came to my picks. If you are reading this and also follow me on Twitter, then the chances are you’ve seen mock drafts shared from the website Fanspeak and are aware of what it is. In case you are not aware, Fanspeak is a great site that allows users to put on their GM hats and run through a simulated draft as you pick players to add to your favorite team. As you pick, it presents the best available players by overall rank and shows who the other teams picked as well. It has multiple big boards to choose from with every player eligible for the draft ranked and you can also work trades with teams. It’s an amazing tool for any Draft nerd like me and I highly recommend you check it out if you haven’t already. As you can see, there was some really great talent to choose from. Vita Vea, Tremaine Edmunds, Da’Ron Payne and Derrius Guice were all tough to pass up but I took the positional value here. 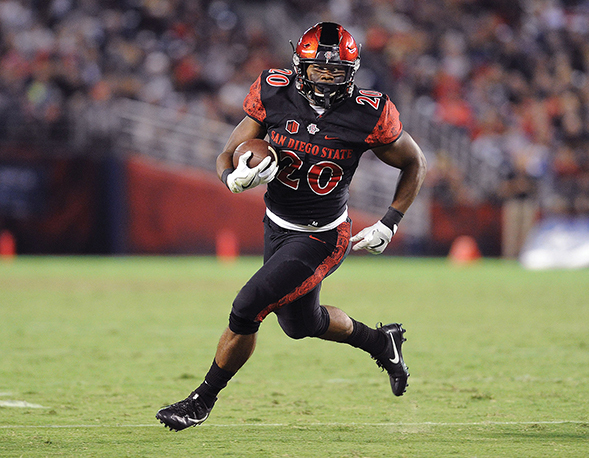 This pick may come as a surprise to you, but edge rusher is, in fact, a need for this team. 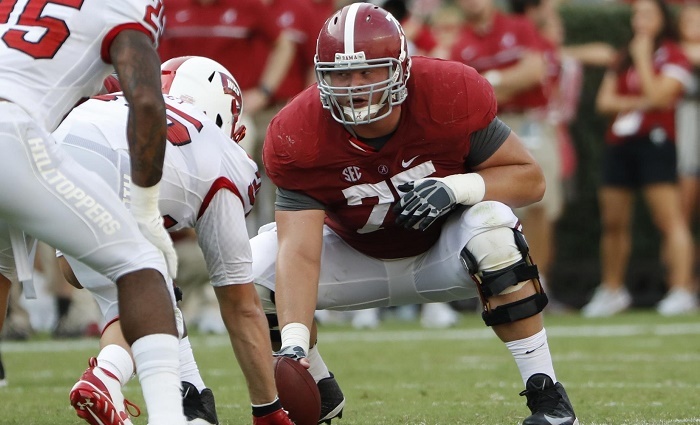 Outside of Ryan Kerrigan and Preston Smith (who’s due to be a free agent next year), the Redskins currently only have former 2nd round pick out of Alabama Ryan Anderson backing them up on their roster. Anderson, to put it mildly, underwhelmed as a rookie last year getting very little playing time and not showing too much when he did get his chances. I’m not yet hitting the panic button on Anderson, he could show improvement going into his second season much like Kendall Fuller did or even Morgan Moses. Landry would bring speed, explosiveness, and a great motor to the Redskins front seven. Landry is much akin to Vic Beasley and had an impressive showing at the NFL Combine, running a 4.64 forty-yard dash with a 1.59 ten-yard split. In this passing league that is the NFL, you can never have too many pass rushers and Harold Landry is the second best pass rusher in this draft after NC State’s Bradley Chubb. I think this value would be too tough to pass on. The Redskins actually don’t pick this late into the 2nd round currently but this is a great round to trade back in. When the Redskins were on the clock, the Ravens offered to swap 2nd round picks while also including their 3rd round pick. The 2nd round will be loaded with talent, so this was an easy offer to accept. The Redskins have made it no secret that they plan on addressing their need to upgrade the running back position. They have also lead us to believe that they will address this need early in the draft. This leads many to believe that would mean taking someone like Derrius Guice in the 1st round, which is very possible. However, the way I look at it picking a running back early could also mean picking one in the 2nd round. That is still subjectively early in the draft. Rashaad Penny is a very talented back that played at a smaller school compared to the other top backs in this draft. 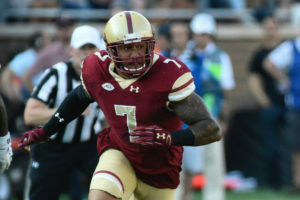 He has the body type (5’11, 220 lbs) to be a number one back, the speed (4.46 forty-yard dash), and can be a good receiver out of the backfield. He can do it all. Trading back in the 2nd round and still getting a top back like Penny would be a dream come true. The Redskins are in need of a new left guard and it doesn’t appear that they will address that need in Free Agency. The only other option is the Draft and lucky for them this draft class is loaded with quality interior offensive linemen. 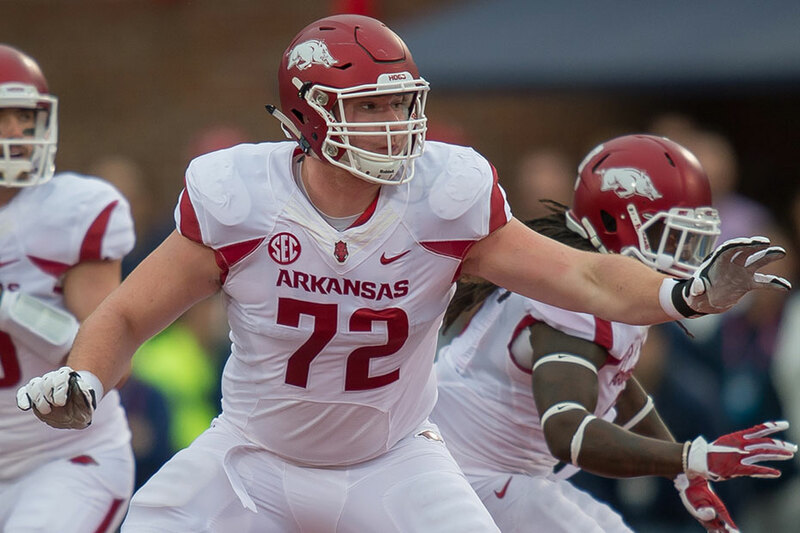 Frank Ragnow is a versatile lineman that has played both guard and center at Arkansas and plays with a big mean streak. While his versatility is a bonus, the center position belongs to second-year man Chase Roullier. Ragnow is one of the top interior linemen in this draft, but because the class is so deep, it very likely could push a guy like him back into the 3rd round even though he doesn’t deserve to go this late. He adds even more toughness to the Redskins offensive line and would be a 10+ year starter. I’m sure most Redskins fans would be angry at Washington for passing on Vita Vea or Da’Ron Payne in the 1st round, and would even more upset about not picking a DT in the 2nd or 3rd round. However, this is also a deep defensive tackle class and there should be quality talent to pick from even in the 4th round. 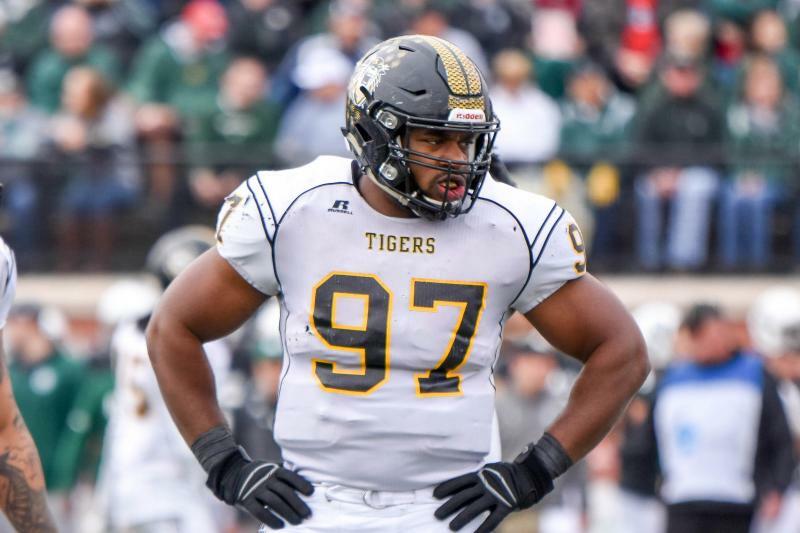 Nathan Shepherd is a Division II player that has shot up people’s draft boards (NFL Network’s Daniel Jeremiah’s 50th overall player in the draft) due to his size, strength, motor, and athletic ability. He’s raw and obviously has the disadvantage of playing lesser competition to these big school guys, but Shepherd oozes potential as a 3 down interior linemen. 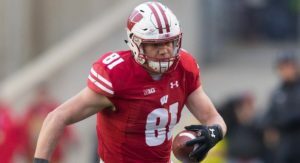 While the TE position is crowded, the need to have depth and prepare for the future is there. Fumagalli is a tough tight end and shows the ability to be a reliable receiving target. What stands out the most to me about him, however, is his ability and willingness to be a blocking tight end. The Redskins’ running game has suffered due to poor blocking from the tight end position. Bringing in Fumagalli will help with that and also give you a young replacement for Davis when that time comes. The Redskins’ offensive line depth was tested in a major way last year, due to all of the injuries that group suffered. That depth needs to be improved. Bozeman is a name not talked about a lot but he comes from a big-time program and played against the top competition in the country. He was also noted as being a standout during the Senior Bowl this year. 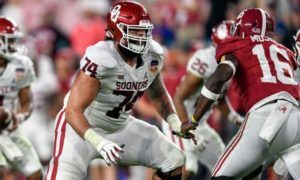 Adding a talented interior lineman this late in the draft would be a big boost to the Redskins’ depth on the offensive line. Losing Kendall Fuller hurt this offseason, but it was necessary to ensure that the Redskins got a good quarterback in Alex Smith to replace Kirk Cousins. Stroman is a good cover corner but comes with a small frame (only 180 lbs). 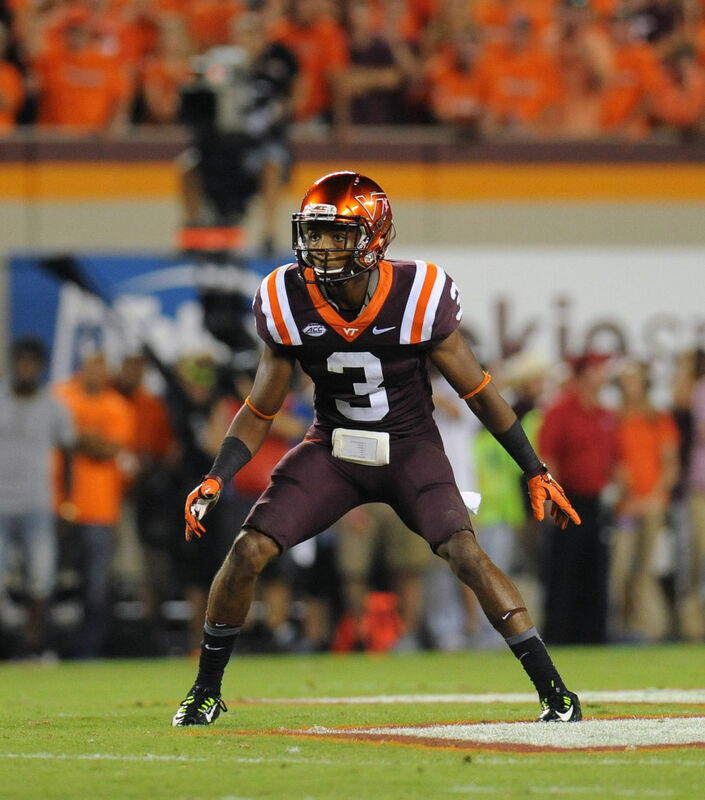 Redskins defensive backs coach Torrian Gray knows his VT corners and I would imagine would be advocating for the Redskins to pick him to add to the CB mix. 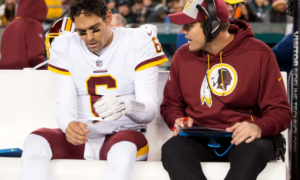 The Redskins were looking for a number two receiver to play across from Josh Doctson, and they believe to have found that in Paul Richardson. 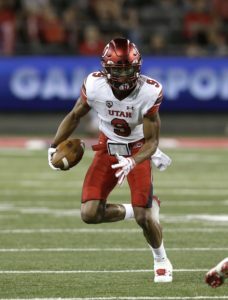 With that move made, I don’t imagine they’d pick another wide receiver in the draft but it wouldn’t hurt to add another receiver to groom. 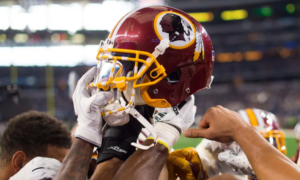 After Doctson, Richardson, and Jamison Crowder you have guys that the Redskins like and hope to make big leaps in development like Maurice Harris and Robert Davis. 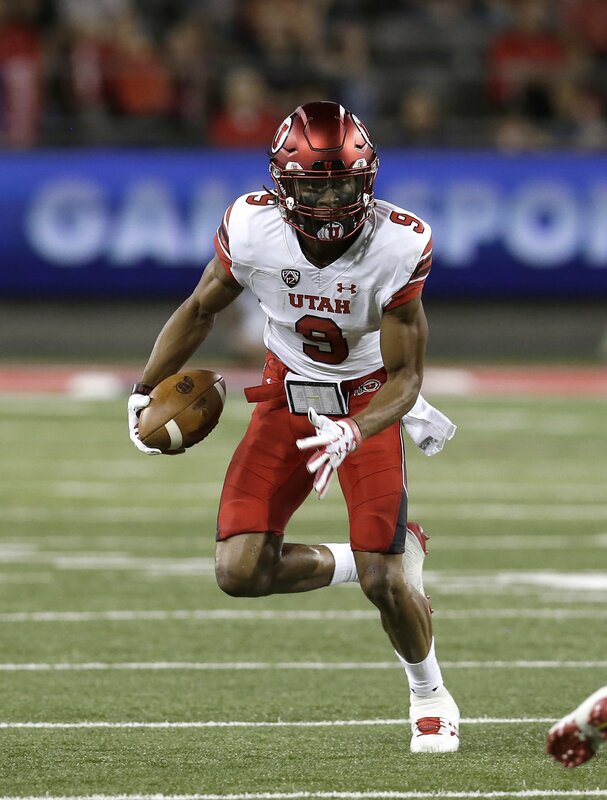 Adding a tall receiver like Carrington to groom and perhaps stash on the practice squad gives the Redskins an option to look at for the future.